There are some times that a person is given a chance to look at something with a fresh perspective. 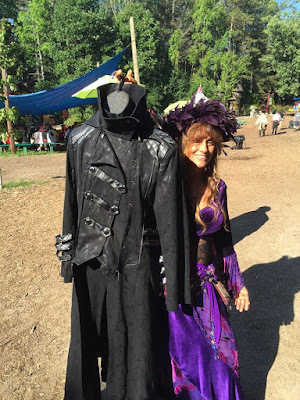 One such time is when I was offered a chance to Review the Michigan Renaissance Festival in Holly, Michigan. My husband and myself have both been fans of the Renaissance for years, but in the last several we would go in, look at our favorite shops for something new, then we’d leave. But this time we planned on getting there early enough to see most of the shows and stay the whole day. We’d be going as if we had never been there before giving us a chance to fully look at this event as a brand new thing. 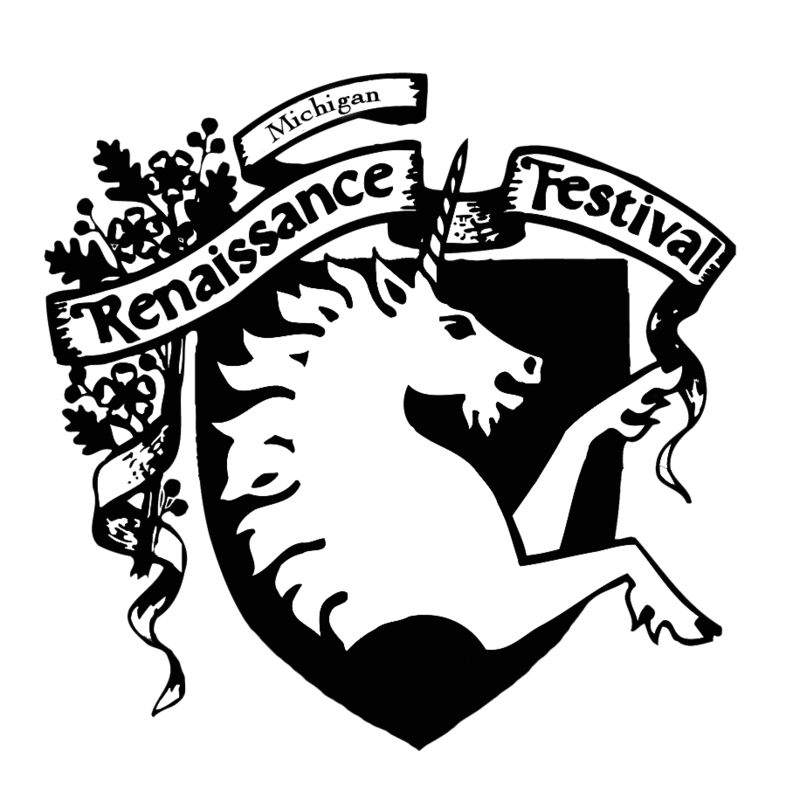 The Michigan Ren Fest has been running for over 35 years, growing from a small 5 weekend event attracting 11,000 patrons to a destination event that attracts a quarter-million visitors and encompasses a 17 acre town complete with 17 stages of various size for entertainment, a jousting field, food shops, and over 300 artisans from across the country ready to sell you their wares. The directions to get to the faire are actually easy to understand which means getting there without any real problems. We arrived around nine thirty in the morning, and out at the road side directing traffic were two or three police officers already. This made it easy to get into the grounds and kept traffic flowing at a decent pace. Parking is free, and they have a number of huge - and I do mean huge - fields with plenty of workers in yellow vests directing people on where to park. Getting there early ensures you get a good parking spot towards the front of the faire grounds. Otherwise you may have a bit of a walk. They even have porta-johns halfway between the roadside and the faire gates if you find you're in need. The gates are set in a semi wooded area, so there’s plenty of shade to wait for the opening show and cannon. Plus they have a number of performers to keep the gathering people entertained while waiting for those last few moments before the Queen arrives for the opening show. 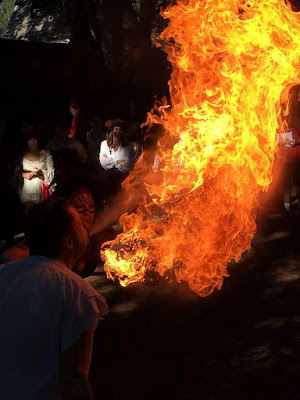 I’m sad to see a favorite of mine (Phillip Graves, Undertaker and Fire Eater) announcing that this will be his last show at the faire after 30 years, but I look forward to who they will bring in the coming years. Bag check is done before you reach the gates and it’s a pretty easy and simple task, there was no waiting in line, they simply looked in the bag to make sure nothing dangerous would make it into the grounds before we were allowed to join those watching the performers as they joked with the crowd and did some fire breathing tricks which I found to be a great way to start off the day. At a few minutes to ten, the royal court and Queen would walk down the walkway and have a small show in the major Holly Grove, which is what they call the faire grounds. The actors all spoke clearly and their outfits were beautifully put together to match the era. At the end of the show, The cannon would sound somewhere hidden in the back of the faire, and the gates would open to allow people into the grounds. Of course the royal court would enter first which gave them a chance to set up inside the village square around the maypole, Upon entering we were greeted with a large group of the court, the queen included, dancing and looking like they fully enjoyed this. They would even pull in a number of the crowd to join in the dance which was very fun to watch. The picture above is the gate house which you can see the gates off to one side. Fire Breathers preforming before the opening show. Queen Elizabeth, during the opening show while she was talking to the major of Holly Groove who was on top of the gates. Coat we bought from Jiva Originals, which offers a lot of one of a kind wares. There is a children’s playground with a petting zoo type area that is well kept and in the shade just next to the first row of buildings that offer food in the front of the area. In the past I have seen the Queen walking through there and talking with the children which is a great experience for any little child. As well as plenty of easy games and rides for people of all ages to enjoy if shopping or the shows are not your thing. The grounds are also pet friendly, I do believe all pets have to be registered before they can enter the grounds, and many shops actually have bowls of water down for the dogs to drink from and many animals are dressed up as well. I have to say I rather enjoyed speaking to those who were at the grounds, many who dress in era clothes were very friendly and easy to talk to. When one in passing heard I had been sitting out under the sun for the jousting, he turned and asked if I needed water. I had never spoken to this man before in my life, but the fact he was asking out of concern made me smile as I replied. There is a gazebo right where I was standing for this shot, making this a really beautiful spot in the faire grounds. Each stage has a listings of different acts at various times, many of the shows are worth seeing and are free to see aside from tips or CD’s you want to purchase afterwards. I’m glad to see so many still there after some time, and look forward to always seeing what new things they bring every year. Or even seeing old favorite routines again, such as the Bagpipe / Drum band Tartanic - who are celebrating their 15th year together - or Ren Fest staple Ded Bob. Many shows are children friendly, but there are some that happen around five pm, or a little later that are adult only because of the humor. So it may be best to make sure the little ones are going to a show that is proper for them. I have to say a favorite of mine was the jousting, even if I did end up sunburned because of it. Which was the one downside, there’ve very little shade at the jousting field and on a hot day it was almost unbearable to sit there without water. I would love to see some tarps even put up like at a few of the other stages over the benches so those who can’t sit out in the sun for long can enjoy the show as well. The knights clearly enjoyed getting the crowds worked up and interacting with each other as they fought, and afterwards they would move to the edges and let people ask them questions or let people pet the horses. In the end, there are more shows than what one person can see in a day, One has to make a choice at the start of the day to figure out what shows you want to catch and when. Some of the stages have their benches fill up fast as well so make sure to keep an eye on the time while you wander. You may find that it’s good to show up early and catch the end of one show in order to have good seating for the next - and who knows, maybe you’ll find your new favorite Fest act this way! There are many, many places to get food, but the lines do tend to get long and very crowded around the back of the jousting field and at the front of the grounds. The Turkey legs are great to have and very large, well worth the price, and a favorite of my husband’s is a scotch egg - try this delicacy early, as in past years it has sold out quickly. My favorite has to be the soups in a bread bowls. There are several places to get alcohol, the main one being the Big Guinness Pub, which also has a stage set off to one side. It’s covered in vines and looks beautiful, but it can get a bit crowded at times if you go towards the pub side. At seven, the cannon sounds again, announcing that the faire is closing for the day and to have people make their last rounds or buys before heading back to their cars. Getting out of the grounds tends to take a bit as everyone is trying to leave at once, but there are police at the road again to direct traffic and make sure things go as smoothly as possible. Over all, the day was extremely fun and despite the sunburn that I received it was great to look at something I loved to go to with new eyes and find new reasons to love the faire. I saw several new shows and took so many pictures of the it’s been hard to pick my favorite ones to add to this. The ground’s have expanded in recent years and I can’t wait to see just what they add next. I look forward to going back next year and seeing everything again. If you get the chance to go out to the Renaissance faire I highly suggest you do so. It’s like stepping backwards through time, or like looking through a window as people in normal day clothes mix with those in era. There is so much out there to see and do, you almost need more than one day to go to the faire. But it’s well worth it to go, and something different and interesting to take the family to. Here are some of my favorite pictures I managed to take during the Jousting. There are also Halloween event's that happen here at the faire grounds; while I've never been to these events but I plan on returning for these. Ren fest is my favorite. I love how kind everyone is! Wow, looks like you had a really awesome time. Loving all the pictures! I love festivals. Oh I just love renaissance fairs! This one looks fantastic, I just love the costumes too.